At one time, heart disease was a death sentence. In The Heart Healers, world renowned cardiologist Dr. James Forrester tells the story of the mavericks and rebels who defied the accumulated medical wisdom of the day to begin conquering heart disease. By the middle of the 20th century, heart disease was killing millions and, as with the Black Death centuries before, physicians stood helpless. Visionaries, though, had begun to make strides earlier. On Sept. 7, 1895, Ludwig Rehn successfully sutured the heart of a living man with a knife wound to the chest for the first time. Once it was deemed possible to perform surgery on the heart, others followed. In 1929, Dr. Werner Forssman inserted a cardiac catheter in his own arm and forced the x-ray technician on duty to take a photo as he successfully threaded it down the vein into his own heart...and lived. On June 6, 1944 - D-Day - another momentous event occurred far from the Normandy beaches: Dr. Dwight Harken sutured the shrapnel-injured heart of a young soldier, saved his life and the term "cardiac surgeon" born. Dr. Forrester tells the story of these rebels and the risks they took with their own lives and the lives of others to heal the most elemental of human organs - the heart. 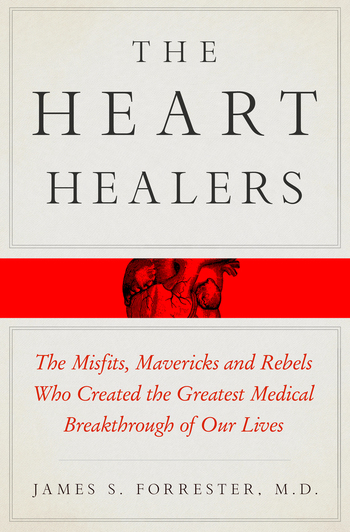 The result is a compelling chronicle of a disease and its cure, a disease that is still with us, but one that is slowly being worn away by "The Heart Healers". A shocking occurrence ceases to be shocking when it occurs daily. JAMES S. FORRESTER, MD, is an Emeritus Professor and former Chief of the Division of Cardiology at Cedars-Sinai. In addition, he is a Professor of Medicine at the David Geffen School of Medicine at the University of California, Los Angeles (UCLA). Dr. Forrester developed the Forrester classification of hemodynamic subsets of acute myocardial infarction. In the early 1990s, he led a team that developed coronary angioscopy. Dr. Forrester is the second-ever recipient of the American College of Cardiology's Lifetime Achievement Award, its highest honor. He lives in Malibu, CA with his wife who is also a physician.